I finally presented my thesis titled The Architect-Client Relationship. An Ever-Existing Problem in Post War Greece last Thursday, and now I can happily say that I'll be officially graduating in November. Sorry I've been absent from this blog for so long, but it couldn't have been done any other way. Hopefully, I'll soon be able to remember once again how all this blogging thing is done. 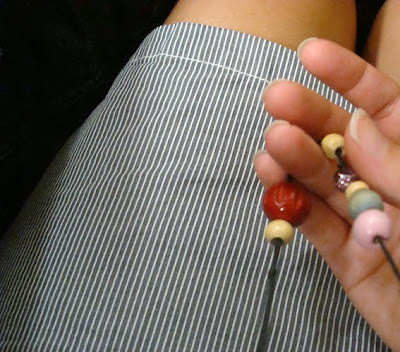 An H&M A-line skirt with tiny grey-and-white stripes, my silver-grey Maloles flats, a plain black t-shirt and this wooden bead handmade necklace for touch of colour. CONGRATS!!!!!! congrats congrats congrats congrats congrats!!!! what i can say but congratulations!! Sigxaritiria!! !Ante kai sta dika mas, mpravo Lopi!! Congratulations! It will be good to see you back on the blogging circuit. opa architect's post! ARCHITECT'S ME TH VOULA!!! congratulations girl! kali stadiodromia, wish you every success. And welcome back! Fantazomai tha eisai polu xaroumeni!! Μπράβο ρε Λοπ! Καλή σταδιοδρομία λοιπον απο δω και πέρα! Kala apotelesmata!! Ki ego paromoia me sena!!! u must be proud and relieved!! congrats on your thesis presentation lopi. hope you find time to relax and blog away. great great great! καλη σταδιοδρομια! ps)about time kuz i missed your posts! A HUGE congratulations to you! Wow!